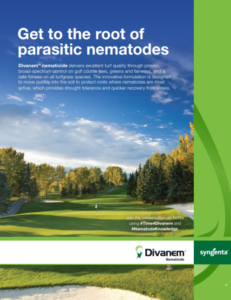 Nematodes are destructive, parasitic pests that feed on plant roots and damage turf quality. 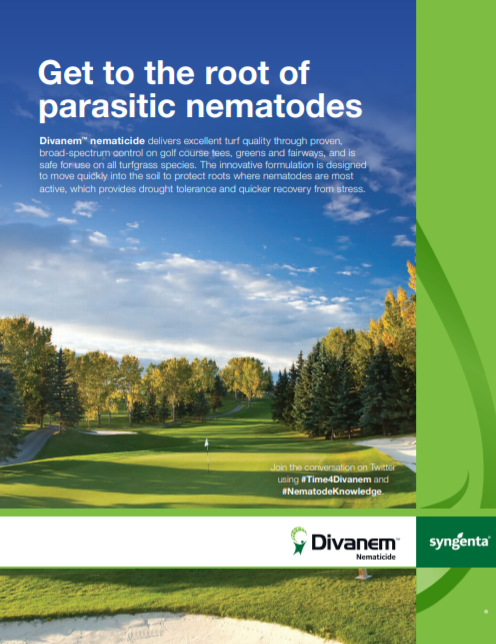 To address this issue, Syngenta developed Divanem nematicide, a new product for the turf industry with proven, broad-spectrum control of sting, lance and root-knot nematodes. G&S Business Communications (G&S) and Martin Williams (MW) were tasked with developing an integrated launch campaign for Divanem in early 2017 that targeted golf course superintendents. The launch included print and digital advertising, news releases, media tour, targeted e-mail communications, new webpage, soil sampling kits, social media support and a pay-per-click (PPC) campaign. Introduce Divanem to the turf industry through a variety of media. Educate industry professionals about the features and benefits of Divanem. Acquire media coverage in targeted trade publications. G&S and MW worked together to develop a comprehensive campaign that clearly and effectively directed audiences to the information they needed about Divanem. We used a myriad of tactics to communicate with the target audiences via all the different ways they obtain information, ranging from traditional print tactics to targeted digital tactics and in-person experiences. The launch aligned well with the 2017 Golf Industry Show in Orlando, Fla., which is a target region for nematode stress. The show gave us a great opportunity to reach a lot of superintendents and media in a focused time and area. 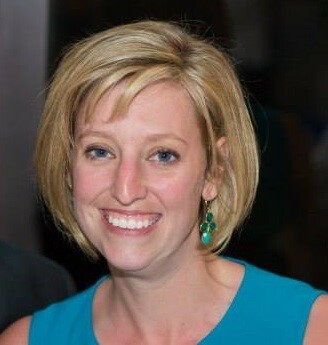 At G&S, we like to make informed decisions that drive our communications strategy for clients. To do this, proper metrics and analytics are essential and invaluable insights. For several aspects of this campaign, including social media, PPC, website and e-mail communications, we were able to target specific audiences based on interests or historical purchases, and customize our communications to better align with their needs. Gathering metrics along the way allowed us to fine-tune the tactics for maximum impact and provided insights for future Divanem communications. Additionally, we worked closely with MW to ensure different aspects of the campaign complemented each other creatively for a strong, unified launch.